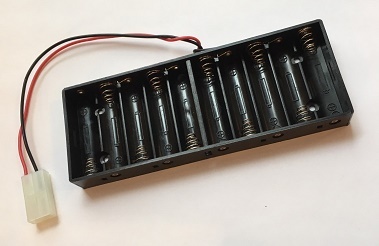 10AAT : 10 x AA battery tray with Tamiya connector. Home > Chargers > Charging Trays > 10AAT : 10 x AA battery tray with Tamiya connector. 10AAT : 10 x AA battery charging tray. Has Tamiya connector. Ideal for charging sets of AA batteries, OR load Alkaline cells in for instant power for portable applications requiring 12-15VDC. The 4AAAT is a battery charging tray that holds 4 x AAA "triple-A" battery cells. Has Tamiya connector. Also handy for other portable applications requiring 4.8 - 6VDC. 6AAT : 6 x AA battery charging tray with TAMIYA conn.
6AAT : 6 x AA battery charging tray. Has Tamiya connector. Cells load in series; Plugs directly into charger when NiCd or NiMH cells are used. Provides 9VDC power when Alkaline cells are inserted. 4AAT: Battery Charging Tray for 4 x AA cells. Has Tamiya connector. Cells load in series; Plugs directly into charger when NiCd or NiMH cells are used. Provides 6VDC power when Alkaline AA cells are inserted. 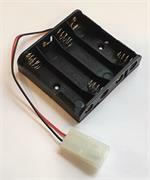 4CT : 4 x C battery charging tray with TAMIYA conn.
4CT : 4 x C battery charging tray. Has Tamiya connector. Cells load in series; can be plugged directly into a charger, or used for other DC power applications. 4DT: Battery Charging Tray for 4 x D cells. Has Tamiya connector. Cells load in series; can plugs directly into a charger. Load with Alkaline cells for 6VDC instant power. 8AAT : 8 x AA battery charging tray with TAMIYA conn.
8AAT: Battery Charging Tray for 8 x AA cells. Has Tamiya connector. Cells load in series; Plugs directly into charger, has many other useful applications. The 8AAAT is a battery charging tray that holds 8 x AAA "triple-A" battery cells. Shape is 4 front, 4 in back. Has Tamiya connector. Can be used to charge NiCd or NiMH cells. Can also be loaded with 8 x Alkaline cells for instant 12VDC power. 8CT: Battery Charging Tray for 8 x C cells. Has Tamiya connector. Cells load in series; can plug directly into a charger. Load with Alkaline cells for 12VDC instant power. 8DT: Battery Charging Tray for 8 x D cells. Has Tamiya connector. Cells load in series; can plug directly into a charger. Load with Alkaline cells for 12VDC instant power.